The lands that comprise the East Bay Chapter are located at the convergence of the San Francisco Bay, the North and South Coast Ranges, the Sacramento-San Joaquin Delta, and the San Joaquin Valley. The East Bay Chapter area supports a unique congregation of ecological conditions and native plants. Based on historic botanical collections, the pressures from growth-based Bay Area economies have buried many of the botanical treasures of the East Bay. 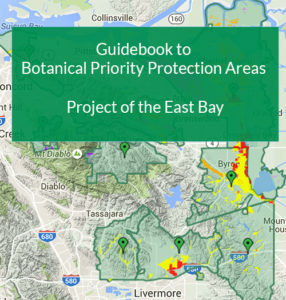 The collision of floristic protection and economic growth conceived the Botanical Priority Protection Areas Project (BPPA), and fortified intra-chapter collaboration between the Plant Science and Conservation arms of the East Bay Chapter of the California Native Plant Society (CNPS). In January of 2006, the Bay Area Open Space Council (BAOSC) requested that our chapter provide them a list of important botanical areas. Our botanical priorities were to be incorporated into BAOSC’s Upland Habitat Goals Project which aims to increase the acreage of protected lands and develop an increased awareness of key habitats among land management agencies and local jurisdictions. We had only one day to accomplish the difficult task of choosing between many botanically rich areas of Alameda and Contra Costa counties. At the end of the day, after a flurry of emails, fifteen areas endowed with native plant diversity that are threatened by current and potential land-use decisions were hastily identified. This inquiry and resulting cache of botanical areas begged another question: how can we look at these areas through a more objective lens utilizing existing information? To answer this initial question, the project began as a simple Geographic Information System (GIS) exercise. Heath Bartosh, the chapter’s Rare Plant Committee Chairman, began by mapping primarily watershed-based boundaries of each protection area. Overall, the 15 BPPAs comprise 238,225 acres (372 square miles) in Alameda (96,932 acres) and Contra Costa (141,293 acres) counties. The BPPAs occupying the western portion of the chapter are smaller in acreage due the urbanization that has already occurred along the bayside flatlands leaving diminutive botanical refugia still in need of protection. In the east, vast expanses of undeveloped land containing a broader diversity of habitats and native plant species are still intact as characterized by the larger BPPAs found flanking the Diablo Range. BPPA boundaries were drawn with the intention of excluding lands previously preserved, such as Mount Diablo State Park or lands owned and managed by the East Bay Regional Park District. However, certain BPPAs include public parcels or properties with other conservation status. These are cases where land has been conserved since the creation of these boundaries or where potential management decisions have the potential to negatively affect an area’s botanical resources. Additionally, each acre within these BPPAs represents a potential area of high priority. Both urban and natural settings are included within these boundaries, therefore, they are intended to be considered as areas warranting further scrutiny due to the abundance of nearby sensitive botanical resources supported by high quality habitat within each BPPA. Although a parcel, available for preservation through fee title purchase or conservation easement, may be located within the boundaries of a BPPA, this does not by default indicate that it contains sensitive botanical resources. Parcels within each BPPA should be floristically evaluated on a case-by-case basis to determine their botanical resource value before any conservation activity, land-use change, or development is undertaken. From within these boundaries an analysis was executed of readily and freely available spatial datasets such as botanical resource occurrences, substrates (soils and geology), wetlands, urbanized areas, existing protected areas, and possible threats. From these analyses each of the 15 maps includes a summary table that provides information such as the size of the area, watershed information, relevant substrate information, and botanical resource attributes. The graphic portion of each map showcases protection areas on a 2009 aerial photograph provided by the National Agriculture Inventory Program. Certain BPPAs include areas of edaphic substrates which strongly influence plant species composition and structure. The East Bay is bestowed with significant substrates such as alkaline soils, sandy soils, and serpentinitic habitats. Within a specific BPPA, edaphic substrates were spatially analyzed using Farmland Mapping and Monitoring Program (FMMP) data. The most useful component of the FMMP data locates areas of urbanization and irrigated agriculture. These aspects of the human environment including development and alteration of vegetative cover, soil structure and hydrology have eroded the natural habitat that native plants need to persist. Spatially analyzing edaphic substrate data against select FMMP data shows the amount of these substrates that have been lost due to post-industrial. For example, 17,280 acres of the alkaline soils have been mapped within all East Bay BPPAs. Of those acres, 21 percent containing alkaline soils within our BPPAs have been lost. Although sandy soils within our chapter area are restricted to Contra Costa County, at one time they represented 24,726 acres. To date, at least 33 percent of sandy soils no longer support healthy native communities of plants. Serpentine substrates manifest themselves in three of the 15 BPPAs: Cedar Mountain, Marsh Creek, and North of Mount Diablo. However, none of these habitats has been as significantly impacted as the large serpentine bodies of the Berkeley and Oakland Hills have been from residential development. Following this initial mapping effort, the East Bay Chapter’s Conservation Committee began to utilize the concept in draft form in key local planning efforts. Lech Naumovich, the chapter’s Conservation Analyst staff person, showcased the map set in forums such as the BAOSC’s Upland Habitat Goals Project and the Green Vision Group (in association with Greenbelt Alliance); East Bay Regional Park District’s Master Plan Process; and local municipalities. In the near future we anticipate these BPPAs will be incorporated into the Eastern Alameda County Conservation Strategy, a regional planning effort currently being developed. As a result of this collaboration our chapter also secured grant funding from the Tides and Rose Foundations to prepare this guidebook of these BPPAs. This guidebook includes maps of the 15 BPPAs, which appear opposite pictorial and narrative treatments. These treatments include a written contribution from a guest author, lists and photographs of sensitive botanical resources, a portrayal of the subject areas’ botanical hot spots and noteworthy collection history, and a discussion of threats, opportunities, and constraints unique to each area. With the exception of the guest authors’ contributions, the remaining text appearing in the green boxes was written by lead authors Mr. Bartosh, Mr. Naumovich, and Conservation Committee Chairperson, Laura Baker. As an enticement to professionals and laypeople alike, our guest authors contributed their personal impressions of these areas and why they are important as native plant refugia. Their contributions appear at the top of the page to provide the reader “A Sense of Place” relative to each BPPA. The guest authors include a broad spectrum of individuals ranging from dedicated amateur botanists, established academics, and government regulators. They were provided a list of interview questions to elicit a connection to the BPPA that would appeal to both native plant neophytes and seasoned enthusiasts. These questions were formed into a short paragraph that portrays their impressions and importance of the BPPA. Due to layout restrictions, many of the guest authors’ pieces appearing in this guidebook are abridged versions. Each of the guest author’s entire narratives will be published separately in coming issues of the East Bay Chapter’s newsletter, the Bay Leaf. Each BPPA includes a list of sensitive botanical resources that have been given listing status and comprise: one sensitive natural community; four plant species that are either statewide or locally rare and considered extant; and one historic occurrence that has not been seen for a minimum of 40 years. A section on the botanical hot spots within the BPPA is included that addresses the general locations of this list of botanical resources and colorful collection anecdotes. This list is also accompanied by photos of selected species within each BPPA. An understanding of listing status in California and its regulatory significance is important to understanding the text below that deals with various rankings. Listing status is given for specific vegetation types and native plant species that meet a certain set of criteria. Within our chapter area we recognize three types of listing status: Sensitive Natural Communities; Special-Status Plant Species; and Locally Rare Plant Species. These designations support our labeling of the 15 botanical areas as priorities for protection. Typically, vegetation types that are given an elevated listing status are referred to as Sensitive Natural Communities. Sensitive Natural Communities are characterized as plant assemblages that are unique in constituent components, restricted in distribution, supported by distinctive edaphic conditions, considered locally rare, potentially support special-status plant or wildlife species and/or receive regulatory protection from municipal, county, state and/or federal entities. The California Natural Diversity Database treats a number of natural communities as rare, which are given the highest inventory priority. Current vegetation types treated as Sensitive Natural Communities appear in the California Department of Fish and Game (CDFG) Vegetation Mapping and Classification Program’s List of California Vegetation Alliances. Special-status plant species are those considered listed as Endangered, Threatened, or Rare by the U.S. Fish and Wildlife Service and/or by the CDFG. Regulatory statues that have designated certain plant species as having special-status include: Federal Endangered Species Act (FESA), California Endangered Species Act (CESA), California Fish and Game Code, and the Native Plant Protection Act (NPPA) of 1977. List 4: Plants of limited distribution (a watch list). CNPS List 1B and List 2 species are considered eligible for state listing as Endangered or Threatened pursuant to the California Fish and Game Code. As part of the CEQA process, such species should be fully considered, as they meet the definition of Threatened or Endangered under the NPPA and Sections 2062 and 2067 of the California Fish and Game Code. CNPS List 3 and List 4 species are considered to be either plants about which more information is needed or are uncommon enough that their status should be regularly monitored. Such plants may be eligible or may become eligible for state listing, and CNPS and CDFG recommend that these species be evaluated for consideration during the preparation of California Environmental Quality Act (CEQA) documents, as some of these species may meet NPPA and CESA criteria as Threatened or Endangered. Locally rare plant species are those considered to be: 1) at the outer limits of their known distribution; 2) a range extension; 3) a rediscovery; or 4) rare or uncommon in a local context. All of these are tracked in Alameda and Contra Costa counties by the East Bay chapter of CNPS and published in Rare, Unusual, and Significant Plants of Alameda and Contra Costa Counties. Through this program, the East Bay Chapter has been divided into 40 botanical regions based on vegetation, geology, habitats, soil types, climate, and other factors. Although not regarded as special-status species by the USFWS or CDFG, locally rare plants can receive regulatory protection, through CEQA’s Article 9 and Guidelines §15125(a) and §15380 which state that “special emphasis should be placed on environmental resources that are rare or unique to that region.” CNPS also has the stated goal of “preserving plant biodiversity on a regional and local scale.” Relying on these statements the East Bay Chapter of CNPS maintains a program, started in 1991, that tracks rare, unusual, and significant plants that occur within our chapter. Anthropogenic and environmental threats are a common thread to each BPPA. The inclusion of a discussion of threats, opportunities, and constraints highlights current conservation issues and conveys why these areas need protection. We hope to highlight some of the current, relevant environmental impacts facing the BPPAs, as well as introduce some of the cooperative efforts that are helping bring attention and protection to the unique botanical values of the sites. Our chapter is keenly aware of the challenge facing us as we try to cope with the push to accommodate a growing tide of population drawn to the beauty of our unique East Bay landscape. California’s most enduring but ironically tragic character flaw is that it draws many people to a place of delicate and finite natural resources. With our guidebook, we hope to provide local governments and land managers enough information to make botanically conscious land-use decisions so that our beloved botanical treasure box will bend, not break, under the weight of its growing human population. This project has been supported by funding from the Rose Foundation, the Tides Foundation, and the East Bay Chapter of CNPS. For information on this project please contact Heath Bartosh, East Bay Chapter Rare Plant Botanist. hbartosh@nomadecology.com.